Happy Memorial Day. The past three days have been good for running, but this morning's weather wasn't very parade friendly. I found myself on the treadmill today and I think that was terribly unfair. It's always nice to have an extra weekend day and we've made the most of our Memorial Day break. Schools were closed on Friday so I was able to get around my neighborhood streets without dodging school buses and distracted parents dropping off their kids. Getting in a run on a work day morning is always good because you start with an accomplishment. 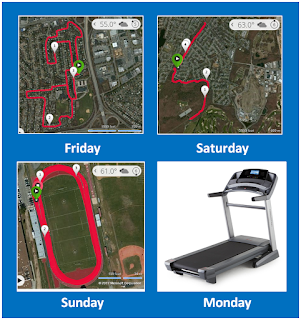 Friday's weather was cloudy and a little humid but, I managed to beat most of my recent paces. Saturday was warmer and less humid. The early morning sun successfully tempted me to the Bethpage bike trail. I parked on Colonial and ran south to Bethpage State Park Picnic Polo Road where the northern part of the bike trail starts. That's a fancy name for the part of the road that connects the admission booth (manned by SIOR's bitter enemy) to the parking lot. He usually lets me in for free by the way, because I'm nice. Anyway, as I approached BSPPP Road for my turnaround, I noticed a steady stream of people passing by the trail head pulling enormous coolers. I heard lots of cheering and yelling and determined that a big soccer tournament was happening on the polo field. I knew it was soccer and not polo because I didn't see any horses, ladies in big hats or VIP areas with tuxedoed waiters pouring mimosas. I did fine on the bike trail although I wasn't able to match Saturday's pace. Every time I encountered a hill (and there are plenty despite what KWL says about that) I thought about the days when I was indifferent to elevation. My favorite experience at Stillwell Woods used to be running the most technical parts, like the Viper Pit that leaves no where to go but up, no matter what direction you're headed. Now I have to psych myself up to take on the handful of steep and mostly short sections that pop up every mile on the Bethpage trail. Yesterday morning was a lot like Saturday, but the difference in humidity was measurable. I went to the track and was fully sweating by the second lap. Some of that had to do with my reaction to having a few other runners on the track which sparked what remains of my competitive side. One runner was positioned exactly half a lap behind me, so I could gauge my speed in relation to his. I did my best to maintain that distance and spent most of the run around 85% max HR. Despite the moist air, I ended up with my best performance of the weekend. Which brings me to this morning. I thought I might wait out the rain, but the news reports weren't very encouraging. By 8:00 AM, my wife was done with her treadmill workout and I was ready to start on mine. With better than average runs the prior three days, I decided to start a little faster than usual. For music, I opted for the 70's channel and when "Low Rider" by War came on, I was inspired to hit the faster button. Today's music mix was runner friendly and it motivated me to keep increasing my speed every couple of minutes. I got up to 90% HR max by the end and paced just a few seconds slower than Sunday's track workout. Overall, I strung four good runs together this weekend and determined that I can push harder than I have without feeling overextended. Even so, at 90% HR max I'm only hitting a mid 9:00 pace. That doesn't give me much room to improve until I can build a little more fitness. I guess it's time for intervals. And I guess a little hill training wouldn't hurt. He sounds like a show off.